Things have been pretty hectic lately. My baby started his summer class a few weeks ago so my hubby and I adjusted our schedules for him. Everything in school is new to him and until now, he still seemed a little bit overwhelmed but slowly adjusting. A while ago when I accompanied him in their classroom he didn't want to let go of my hand but when I told him that I'll just be outside and I'll wait for him to finish, he didn't cry anymore. 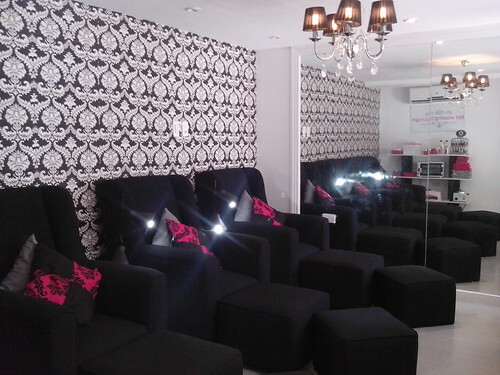 So the few hours of "Me time" that I got to spend at Flirt Waxing Lounge last week was so precious. It was a very relaxing one. Remember my post about Flirt last year? This time, they recently opened a new branch near California Gardens Condominium in Mandaluyong (just across Robinson's Grocery Store). It's very near to my place and my kid's school so it's very convenient for me. 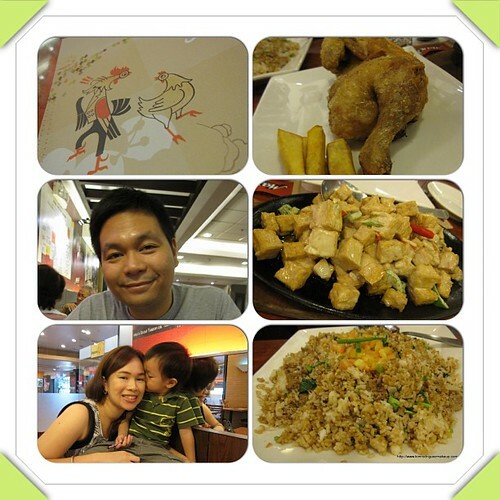 This branch is a bit smaller tan their Kapitolyo (Pasig) branch but same relaxing ambiance, posh interior and quality of service. 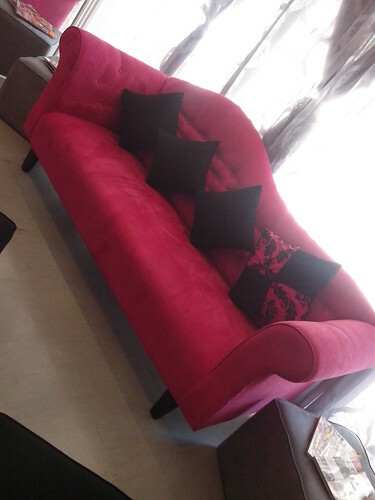 I love this pink couch! 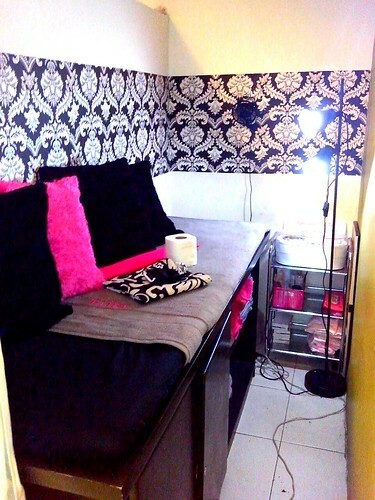 I picture my own makeup studio with this type of girly couch. They only use high quality products and I love that everything is neat. And it's very important that they sterilize their tools before using too. They let me try the Flirt Combo 1 (P560). 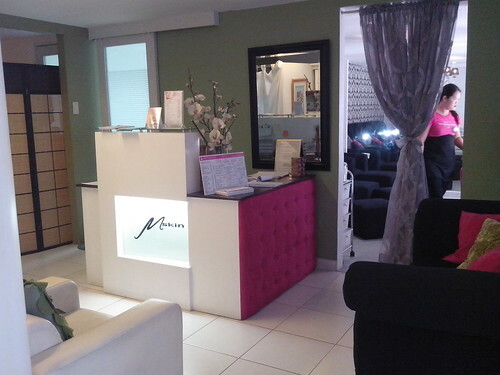 It includes manicure, pedicure and foot spa. 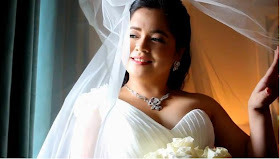 It's very sulit especially if you have plenty of time to relax. I love how the staff massaged my hand and feet. And my favorite part was the cold gel. It really soothes tired feet. One more thing, I seldom go to salons for a mani and pedi because I'm afraid that if I let someone clean my nails, I'd get ingrowns. I specifically asked the staff not to cut the sides of my nails and I was very happy that they listened. Didn't feel a bit of pain. I'm not afraid anymore and I'm very happy to find people who can do my nails regularly. 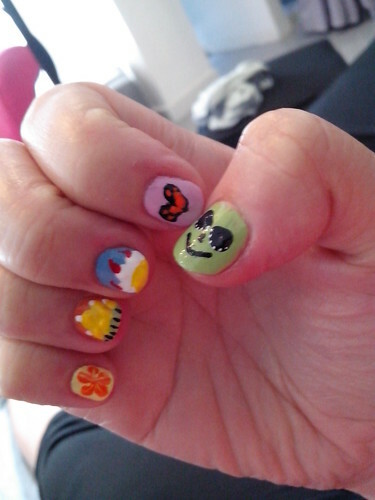 This is Elah doing this kiddie party themed nail art on me. So cute! perfect for my tiny nails. For my toes, I asked for an ORLY purple with glitters nail color. And next for me to try is their signature service which is waxing. 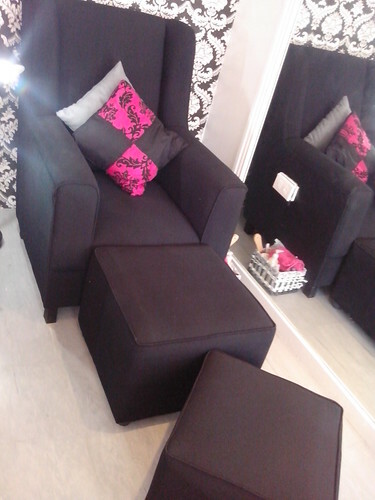 Here's a photo of their posh waxing room. I love the fact that I don't have to go to the mall to have a waxing service anymore. 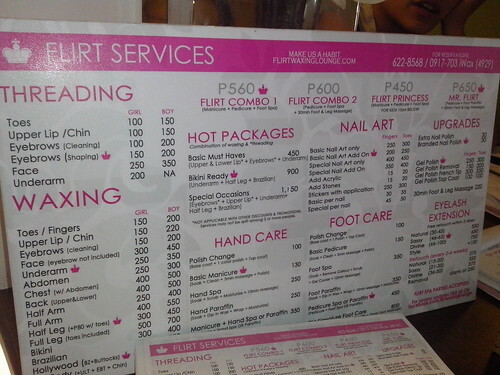 Flirt Waxing Lounge currently has 2 branches: Mandaluyong branch (near California Gardens Condominium right across Robinson's grocery store) and Pasig (Kapitolyo subdivision) main street where the famous restaurants are located. Like their Facebook page to for more info.